Drill a pilot hole; enlarge the bore hole by backreaming as necessary; prepare product for pull-in at the exit end; pull it back through the pilot hole – the basic steps of a horizontal directional drilling (HDD) installation. But what if there is no place to lay out and prepare the product for pull-in? That was the problem faced by Pacific Gas & Electric (PG&E) for a portion of the company’s L-109 pipe replacement program in an area near Redwood City, Ca., where construction was subject to strict environmental restrictions, limited work space and a short, six-month window to complete. 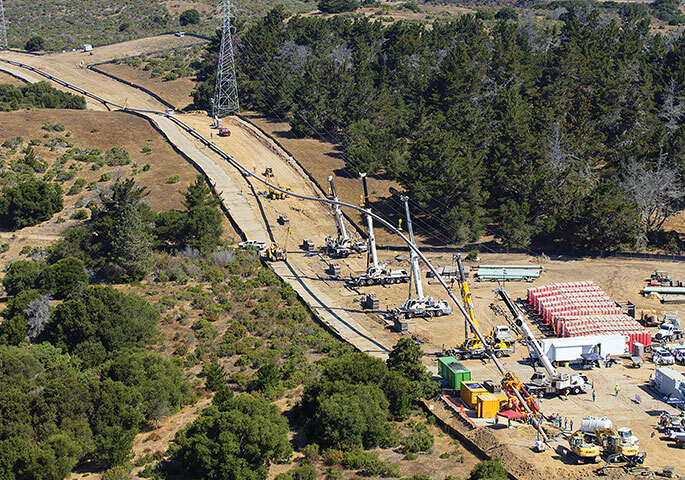 The project was part of the final phase of PG&E’s Pipeline Safety Enhancement Plan. Open-cut construction was used on much of the project, but HDD was determined to be the only way to address one 2,400-foot segment. Restrictions preventing the pullback were both geographical and environmental. “The project paralleled Crystal Springs Reservoir, a highly-protected lake which is San Francisco’s main source of drinking water,” MacIntyre explained. “Due to the land and proximity to the lake, we had close oversight on all operations and took extreme preventative measures to prevent any spills and maintain protection to the area. A team of biologists and archeologists carefully monitored work throughout the project. Snelson and PG&E brought in Jim Brotherton, president of Brotherton Pipeline, to assist in developing a plan that would allow the 2,400-foot HDD installation to be made. Brotherton collaborated with PG&E’s engineering team to design the bore with the use of a pipe thrusting machine to push the pipe string through the bore hole from the launch end. Pipe thrusters typically are used with tunnel boring machines or to assist with HDD pullback in difficult conditions, but not as a single-acting force. “Manufacturer of the thrust machine used, Herrenknecht, confirmed that this is the first time a thrust machine has been used in this way,” MacIntyre said. Brotherton designed a 36-inch bore to be drilled and then the 24-inch pipe to be pushed into the open void without pull assistance for the full length of the bore. The bore was designed at a depth favorable to encountering solid formations, and multiple swabbing passes were used to ensure a clean hole. As a subcontractor, Brotherton made the pilot bore and pullback. Snelson assisted Brotherton with the use of cranes, sidebooms, excavators and coating inspection during the installation. A Cherrington 350 HDD unit was set up in a somewhat level and graded field with plenty of room for supporting equipment, said Peter Anhon, Brotherton general manager. The bore path was in the right-of-way of the San Francisco Public Utilities Commission. According to Anhon, subsurface conditions of the bore path were comprised of approximately 1,000 feet of hardened crystal rock with a minimum 40,000 psi and the remainder of the project went through 20,000 psi mudstone. The drill unit has 350,000 pounds of thrust and develops 40,000-foot pounds spindle torque. Maximum depth was just over 250 feet through mudstone. An 8-inch Horizontal Technology HDD 9-10 4 stage, short-radius, high-torque, low-flow mud motor was used which operates with minimal mud flow allowing the operator to easily adjust direction with its short-radius steering capability. Guidance was provided by a Tru-Tracker guidance system. Horizontal Technology also supplied Viper reaming tools. Completion of the pilot hole and set up of the push machine required about a week. The Brotherton crew was drilling within three days of mobilization. While drilling was underway, Snelson crews welded pipe into one 2,500-foot-long string along the right-of-way, then coated and “jeeped” (inspected) to ensure there were no anomalies on the pipe. Staging of the pipe took less than 10 days and was ready for installation when the pilot hole was completed. The push was performed with the Herrenknecht pipe thruster. A Herrenknecht mechanic was onsite to assemble the final pieces of the thruster and provide support during the push. Access also was difficult at the exit end. “A hairpin turn,” said MacIntyre, “prevented large trucks from accessing the site, making it difficult to transport critical materials and equipment. The construction team worked with the environmental team to figure out a solution, and a half-size split axle trailer was used for transport. Pacific Gas and Electric Company is one of the largest combined natural gas and electric energy companies in the United States. Based in San Francisco, the company’s primary business is transmission and delivery of energy. PG&E provides natural gas and electric service to approximately16 million people throughout a 70,000-square-mile service area in northern and central California. Snelson Companies has grown from a family-owned plumbing business founded in 1946 into one of the country’s premier contractors for oil and gas pipeline, distribution, station and facility construction, and infrastructure integrity services. Corporate headquarters is in Sedro Woolley, Wash.
Based in Gold Hill, Ore., Brotherton Pipeline specializes in directional drilling, natural gas transmission, natural gas distribution, plowing, trenching, vacuum excavation, auger boring, rock hammer boring and underground power installation. Over its 30 years in business, Jim Brotherton and key employees have been instrumental in the design and development of many drilling equipment advances. Bryan Gordon, Pacific Gas & Electric (PG&E) project manager for gas transmission pipeline replacement, provided background on some of the challenges the project faced. “The R-046 was a 2.35-mile replacement of L-109 on San Francisco Public Utilities Commission (SFPUC) land adjacent to Redwood City, Calif. It replaced 22-inch pipe installed in 1936 with new 24-inch gas transmission pipeline to accommodate future ILI runs on L-109. It was the third and final L-109 replacement on SFPUC property captured within a shared permitting effort.